Gen. Ulysses S. Grant assigned John Eaton, an ordained Presbyterian minister, to organize contraband camps for the runaway slaves that were flocking to the protection of his army of the western theater. Grant had employed the contrabands as teamsters, laundresses, cooks, and hospital assistants. As the numbers of escaped slaves grew into the thousands, a more permanent solution was required. Grant approved the idea of a refugee camp at Grand Junction, Tennessee, and appointed Chaplain John Eaton, Jr., of the 27th Ohio Infantry, to oversee its organization and operations in November 1862. Eaton was assigned the title of General Superintendent of Contrabands the following month. Eaton's first challenge was to provide food, shelter, clothing and security for the refugees throughout the Mississippi Valley. By 1863, he had received a commission as colonel of the 63rd United States Colored Infantry Regiment. Later he was appointed assistant superintendent of a district for the Freedman’s Bureau, which he held until his resignation in 1865. 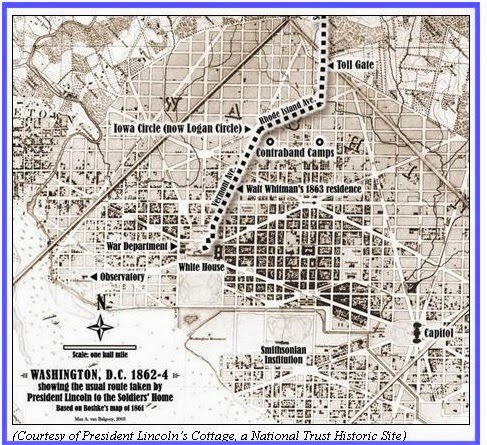 It appears that most major cities behind Union lines had contraband camps as is shown in this map of Washington, D.C. There is information on the internet about some of these sites but the heavy lifting will be done by scholars and genealogists in the federal records at the National Archives in Washington, D.C. The place to start will be in the records of the Freedmen's Bureau (Record Group 105) and related military records. The Last Road to Freedom website is starting this process by extracting the lists of settlers in the contraband camps. An example of a list of camp settlers is here. The federal government became integrally involved with the lives of African Americans during the Civil War and Reconstruction period. This involvement was principally managed by the Army and the Navy during the War. It is estimated that approximately four million slaves became freedmen through a variety of federal laws and presidential proclamations culminated by the Thirteenth Amendment to the Constitution. The federal government established an agency in 1866 to assist the newly freed men, women and children which is usually called the Freedmen's Bureau. The formal name of this agency was the Bureau of Refugees, Freedmen, and Abandoned Lands. This more formal name is somewhat more explanatory of their role. Feeding the refugees, educating the freedmen and employing freed people on the abandoned lands were all included in their duties. The Freedmen’s Bureau inherited many of the records associated with the contraband camps but some of the records remain in military files. An overview of the Freedmen’s Bureau records can be found here. “Of all of the types of records listed in the appendixes to the three-part inventory of records of the bureau field offices, the "pre-bureau" records are particularly valuable for research on African Americans during the Civil War. Because there was no centralized agency such as the Freedmen's Bureau during the war, records for this period are not as plentiful and are more difficult to locate, but they do show how the federal government became involved with freedmen and why the bureau was established. As soon as the war commenced, slaves fled to Union lines or were abandoned by their fleeing masters. Since most possessed little more than the clothes on their backs, the military began to dispense basic relief of food, clothing, and shelter and to employ as many as possible. In parts of the country where large numbers had gathered, commanders appointed superintendents to be in charge of all affairs relating to them. When Secretary of War Edwin Stanton appointed Oliver O. Howard to be commissioner of the bureau, he reportedly gave him a large basket of records of the superintendents of freedmen, and these, most likely, are the pre-bureau records in RG 105. The potential that these records hold for African American history and genealogy is enormous. Next time we will summarize the story of the “Volunteers of African Descent” and the rich records of the pension files at the National Archives. Stay tuned!